Seagate has launched as they claims world’s first 1.5 terabyte (TB) 2.5-inch portable external drive. 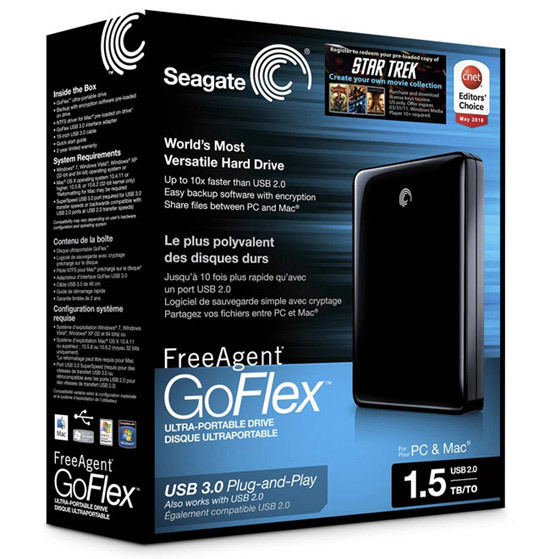 The Seagate FreeAgent GoFlex offers USB 3.0 connectivity, it is compatible with Mac and PCs and comes with a free copy of “Star Trek” and the option to purchase up to 20 other films. The new black glossy 1.5TB GoFlex drive comes with USB 3.0 interface cable, which Seagate claims will allow transfer speed up to 10x compared to a USB 2.0 port and can transfer a 25GB file in under five minutes. The drive also features GoFlex storage system, that offers upgrade cables and kits that make it easy to move up from USB 2.0 to USB 3.0, eSATA or FireWire 800 and allows you to upgrade your interface for faster transfer speeds, and access your content on your network, your TV, and everywhere you go. The 1.5TB GoFlex drive is available now for $249.99.